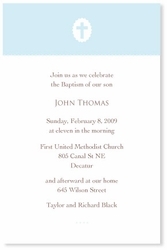 Description: This sweet and simple invitation features a cross medallion on a blue background. Perfect for baptisms, first communion or even as a birth announcement. Customize the color by gender for your celebrant or to match your party color scheme. Select "custom color" from the dropdown menu.